We have all breeds and all ages! Our animals change every day. Your best bet is to come in with your family and look around. The first step in the adoption process is to complete our adoption application. You can download this by clicking here. Be sure to bring the completed application in with you, or we can provide you an application while you are at the facility. Proof of address is also required via a valid state drivers license or identification. If you only have a cellular phone, you must bring in a copy of a recent cellular phone bill to verify that the phone number is for the address shown on your identification. If you have a child under the age of five, the animal must be older than 3 months of age. We strongly recommend that all members of the household, including children, come along to the shelter to meet their new pet. Also, some of the larger breed dogs require "house checks". This simply means that one of our investigators goes to your home and checks for yard space, fencing, etc. If you live in an apartment or condo, you will need to bring a copy of your lease or condo policies to show that you are allowed pets. 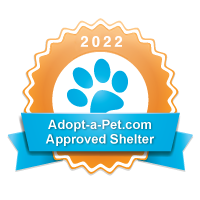 We also strongly recommend that once you have chosen a pet here at our facility, and you currently have a dog, that you bring your pet in to conduct a "pet introduction". Nothing is worse then bringing home a new dog that just will simply not get along with your dog and you need to bring him or her back to the shelter. We feel that is just not fair for the dog or your family!